Ever noticed how nice a piece of driftwood covered in Java fern ( Microsorium pteropus ), or Java moss ( Vesicularia dubyana ) or even just plain algae looks? I call such pieces aquatic hanging gardens because the plants are not at the bottom as one would expect. This month I will cover how to make one of these gardens. First let's tackle the driftwood. Aquarium stores can provide driftwood of three types: mopani wood, mangrove root, and softwood attached to a slate. All three types are very convenient because they stay submerged, but they are not cheap. Mopani wood is very dense, almost rock hard when dry and comes with two tones; a light beige and a contrasting very dark brown. It comes from Africa and sinks readily. I have never used it, so I can't comment on its merits as a hanging garden platform. I would suspect plant roots would have difficulty attaching to mopani. Mangrove root is one of my favorites. It is hard, with a gnarled surface, very dark brown, splinters quite easily and sinks without having to be waterlogged. Its gnarled surface and the many cracks make it ideal for plants to anchor their roots (I even had a Hygrophila polysperma attach itself to a piece). The dark color contrasts well with the green from the aquatic plants. The softwood attached to slate comes in many different sizes and shapes. They are basically pieces of branches or roots screwed onto a slate. Their surface has been sandblasted so it is fairly smooth and light colored. The wood darkens when it is waterlogged. I've only used this kind of wood once and it didn't last long enough for me to try attaching plants to it. I find these pieces look very artistic but not very natural, so I tossed the piece I had and replaced it with some driftwood I had collected. If using this kind of wood I would make some grooves on it before attaching a plant. A fourth option is to collect your own. If you live near a clean lake that is outside a national or provincial park then you are in luck. A lake or reservoir with fluctuating water levels is ideal. Get a measuring tape (driftwood looks a lot smaller outdoors) and hike out to the shore that the predominant wind blows towards. In there you should find quite the supply of driftwood. Once you find a suitable piece and bring it home you must soak it in boiling water. This will kill any water "bugs" living in the driftwood, drive out air trapped in the wood pores, and leach some of the tannin. The latter will turn your aquarium water yellowish or even brown. This is harmless to fish but your significant other may not like the looks of the tank. The tannin will also discolor whatever pot you cook the driftwood in, so be warned. The driftwood can be coaxed to stay submerged by screwing it to a piece of Plexiglas or plastic margarine container full of sand or gravel. Eventually (a few weeks to a few years) the driftwood will become waterlogged and sink on its own. Now that you have a piece of driftwood it is time to think how to plant the hanging garden. Vertical sections, forks and broad surfaces make ideal planting areas. Java fern can be attached to vertical sections and forks making the driftwood look like it is sprouting leaves. Forks also make it easier to hide fasteners from view. 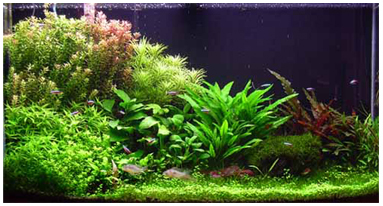 Broad surfaces exposed to light will get covered with algae and make good attachment points for Java moss. The dwarf anubias ( Anubias barteri var. nana ) can also be attached to broad surfaces. There are many ways to attach plants to driftwood. One way is to tie the plants loosely with fishing line, this is particularly so with Java moss. Plants with a rhizome can also be stapled or pinned to the driftwood. Make sure the pin or staple does not go through the rhizome but over it. Also be careful so you don't cut the plant as you staple it. Don't worry about a few pins or staples rusting in the tank, just make sure you and the fish can't get scratched by them. If you are lucky the driftwood will have holes you can put a rhizome and a couple of small leaves through, or cracks that you can wedge the rhizome into. If your Java fern or Anubias arrangement doesn't look good right away, be patient. It will take several weeks for the plants to re-orient themselves to the light and grow enough to hide the fasteners. Meanwhile the old roots can be used to hide the fasteners or serve as attachment points. The new roots are the ones that will attach themselves to the driftwood. They will find the cracks and crannies in the wood and secure the plant firmly. As the plants grow you may need to trim them a little so the driftwood can still be seen. These hanging gardens have added a new dimension to my aquascaping. The plants make the driftwood look very natural and the fish love them. I have a patch of Java fern attached to a large piece of driftwood that almost reaches the surface and is near the filter outlet. The Java fern undulates gently in the current and serves as a staging area for my Corydoras sterbai as they dash to the surface for air. The fern also traps food for the Corydoras and preserves the driftwood from the hungry mouths of the clown plecos ( Peckoltia vittata ) and the bristle-nosed pleco ( Ancistrus dolichopterus ) that use it as their home. In contrast a piece of driftwood that I left bare is now almost gone, all eaten away.